Tests on a river for toxins contaminating the water are under way after a fire in Devon. A fire broke out in a barn containing an ammonium nitrate-based fertiliser in Wotter on Thursday. The Environment Agency said it was running tests to check for ammonia in tributaries into the River Plym. The chemical can be poisonous for fish in high concentrations. The agency said initial water samples had found low concentrations so far. Spokesman Jon Snowden said: "Initial results from sampling suggest that the environmental impact will be minimal. "We had initially advised people to limit recreational water use in the River Plym as a precautionary measure but it is now unlikely that the water quality has been affected." The fire service was called to the scene just before 1300 GMT on Thursday. An 800m exclusion zone was set up and homes were evacuated during the fire. 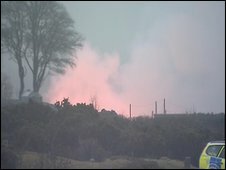 At one stage, officers said people in the nearby villages of Bickleigh and Shaugh Prior might also be evacuated from their homes "in the wider interest of health and safety". It is believed that up to 15 tonnes of fertiliser might have been in the barn, which partly collapsed. People living within the exclusion zone are still being told to remain indoors.